Simply pour CAREfree into the swimming pool once a week! This limited time offer ends February 17, 2012, take advantage before it's to late! 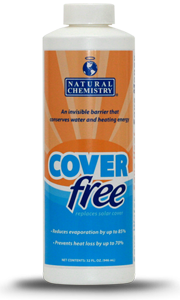 Please visit our Natural Chemistry COVERfree webpage or contact your Export Manager for more information. *Limited to one free case per dealer. Offer not valid on prior purchases or invoices, no exceptions. While supplies last, subject to local availability. Offer cannot be used in conjunction with other offers and is only applicable to swimming pool professionals.